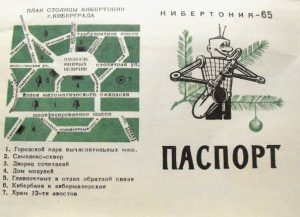 In the introduction to his work on Soviet cybernetics, Benjamin Peters offers the phrase “Soviet internet” as an apparent oxymoron. As he puts it, not only did the USSR’s infamously closed society seem antithetical to the creation of a national network, but the USSR collapsed in 1991 – several years before the internet achieved a modicum of popularity or ubiquity. (1) However, Peters’ book, entitled How Not to Network a Nation, offers a history of the very phenomenon he deemed improbable – a truly Soviet internet. Unsurprisingly, this story encompasses more than a simple Soviet implementation of Tim Berners-Lee’s World Wide Web. Peters describes a multi-decade long effort in the USSR to create an all-union electronic network based on cybernetic principles, a field he defines as “a science of communication and control.” (16) Through this project, researchers endeavored to create a system that could supplement and enhance national economic planning, strengthening the nation’s economy and bringing the Soviet Union closer to its idealized socialist conception. Unfortunately, this project, entitled obshche-gosudarstvennie avtomatizirovannie sistemi, or OGAS, met substantial bureaucratic, fiscal, and military opposition, which lead to its eventual demise. (191-192) However, enough evidence remains of this program’s goals and ambitions to allow for analysis and contextualization. Simply put, this project was intended to be a digital expression of socialism, creating an electronic manifestation of Soviet politics and ideals. Accordingly, this project can be interpreted as an antiquated expression of national identity in cyberspace. The main aspect of this expression is rooted in OGAS’ aim of generalized economic control. As opposed to the American ARAPNET, which was originally conceptualized as a cooperative venture between academia and the military, OGAS was purely devoted to economic planning from its inception. Further, OGAS promoted an idiosyncratic form of economic planning, which promoted a “simultaneous metaphorical and mechanical collectivization of the industrial household.” (109) Peters compares this to cloud computing, in which individuals would be able to connect to the central network from a variety of access points. In other words, OGAS promoted a decentralized model of economics, in which vast numbers of individuals could be mobilized to aid in a collective effort. In a sense, this conceptualization can be seen as promoting an idealized version of Marxist economics. The USSR had a notoriously difficult time in breathing life into Karl Marx’s economic theories, which shaped Soviet economic policy from the era of War Communism onwards. In particular, Stalin’s decision to impose a heavy hand on the Soviet economy ran counter to orthodox communist predictions of a collective participatory economy. Not only was OGAS intended to rectify this situation through technological means, but it attempted to achieve Marxist ideals by creating a foundation for a truly collective economy. In other words, this technological initiative can be seen as a purer expression of the USSR’s central ideology than the nation’s own economy. Given the intricate link between national identity and Marxist ideology in socialist nations, this tangible expression of theory can be seen as an expression of Soviet identity. Soviet nationalism is indivisible from Marxist theory – they were not equivalents, but they were irrevocably bound up in each other. In the Soviet mentality, Marxism defined one’s nation; one’s actions; one’s world; and most broadly, one’s reality. This holistic worldview, combined with the USSR’s status as the world’s first socialist nation, resulted in Marxist ideology being specifically identified with the USSR (as can be seen by the moniker Marxism-Leninism, which supplanted Marxism as the official formulation of socialist ideology in many nations). Although this theory was tainted in practice by real-world concerns, Marxist ideology held a special place in the Soviet world, and was heavily identified with Soviet identity. Accordingly, an expression of Marxist ideology can be seen as an expression of Soviet nationhood, meaning that OGAS’ efforts to create an idealized Marxist economy should be seen as a digital expression of a uniquely Soviet identity. In totality, the history of OGAS demonstrates the inevitability of broader cultural and ideological trends manifesting themselves within technological spheres. 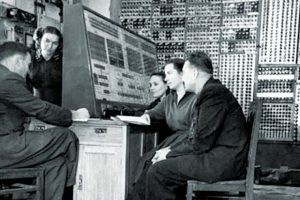 This narrative demonstrates that early as the 1960s, computing projects reflected regional political mores and were fundamentally bound up in the societies that they were created in, a conclusion which we will attempt to show as a general trend in circumstances beyond the USSR. By analysing specific national iterations of communicative technologies, we will show how cultural and ideological factors relate to broader conversations about technology and politics. Peters, Benjamin. How Not to Network a Nation: The Uneasy History of the Soviet Internet. Cambridge, MA: MIT, 2016. Print.